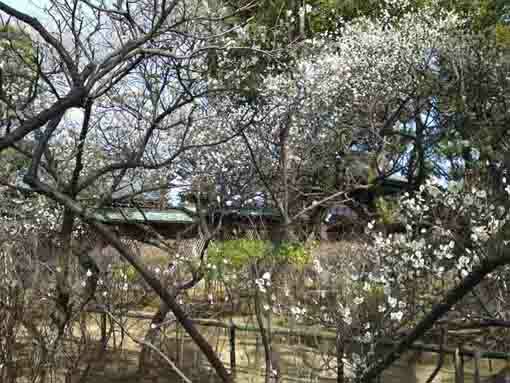 Shirahata Tenjinsha Shrine that many plum flowers blooms and Kafu Nagai loved is on the narrow way to the residential area from both Motoyawata and Keisei Yawata Station. 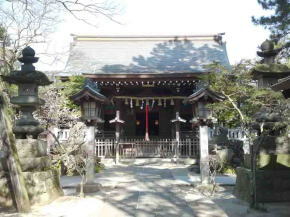 There are stone monuments of Kafu Nagai and Rohan Koda and the framed letters written by Kaishu Katsu hanged on the main hall of Shirahata Tenjin Shrine. 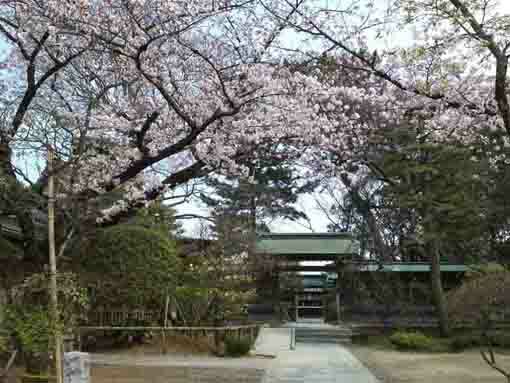 According to legends, Yoritomo Minamoto might camp the land around now Shirahata Tenjinsha Shrine when he would go to the provincial government of Shiousa to rebuilt his arms after he had lost the battle of Ishibashiyama in 1180. 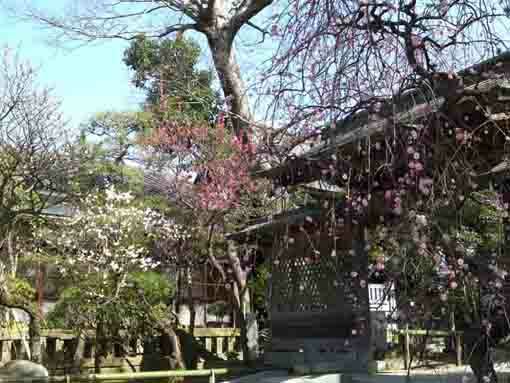 And also Dokan Ota who built Edo and Koedo Kawagoe (little Edo) built the buildings of this shrine. 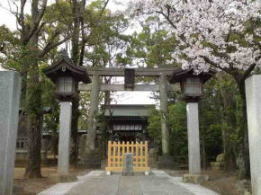 So Shirahata Tenjinsha Shrine is very old shrine that has many legends of those samurai heroes in the eastern Japan. 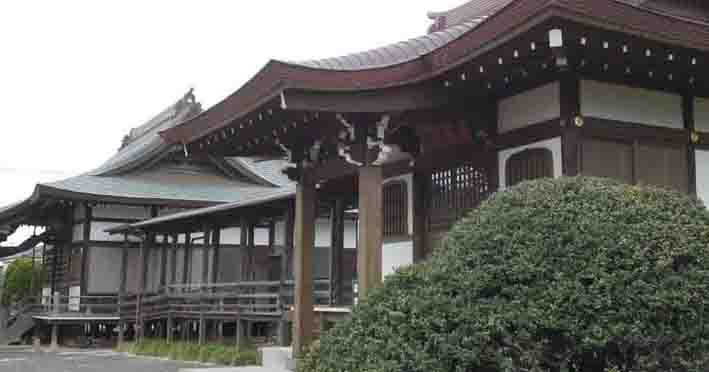 There is no information when Shirahata Tenjinsha Shrien was built in, but Yoritomo Minamoto camped and raised his white flags up here in Sugano in 1180 to go to the provincial government of Shimousa in Konodai when he rebuilt his arm to fight against Heishi Family in Kyoto. 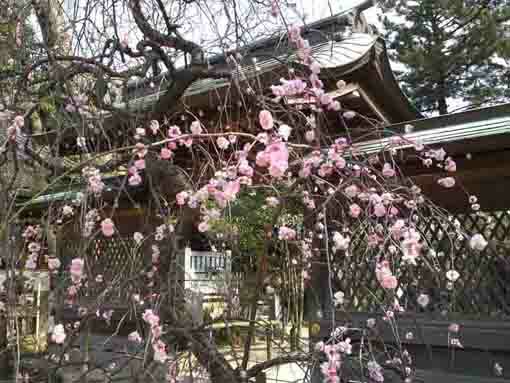 Some records were remained that in the reign of the Emperor Ogimachi in 1584, the buildings in the shrine was renovated, and some said that the renoavation was done by the donation of the samurai worrier Dokan Ota, so Shirahata Tenjinsha Shrine is a very old shrine. 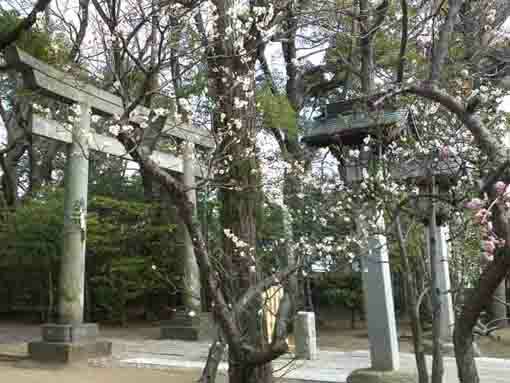 In 1984, Shirahata Tenjinsha Shrine was designated as a model shrine on development projects by Jinja Honcho (Association of Shinto Shrines). 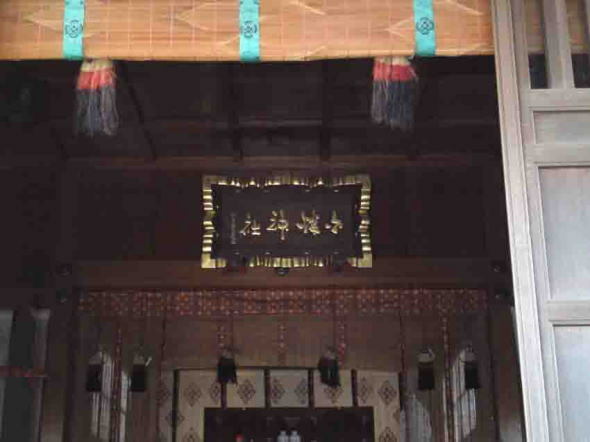 The framed letters hanged on the main hall was written by Kaishu Katsu. The picture to celebrate the renovation in 1879 was painted by Zeshin Shibata and it was designated as the prefectural important cultural property. The divine gods are Takenouchi no Sukune and Sir. 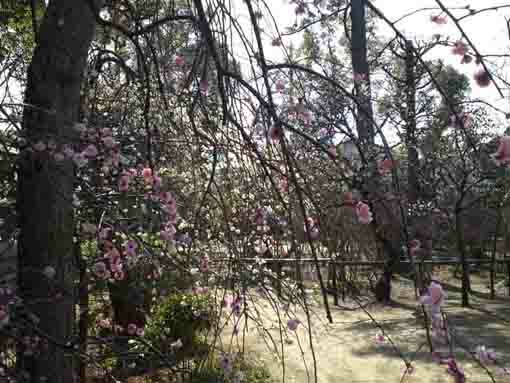 Michizane Sugawara. Takenouchi no Sukune lived for very long life, so he faithfully served the Five Emperors and organized the national affairs. 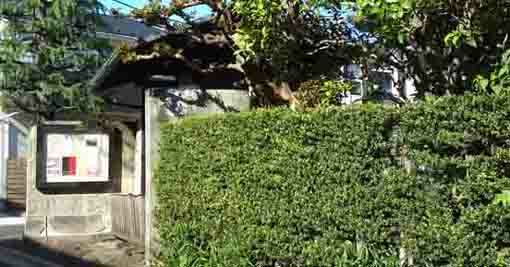 Takenouchi no Sukune is the most loyal retainer in Japanese history. Sir. 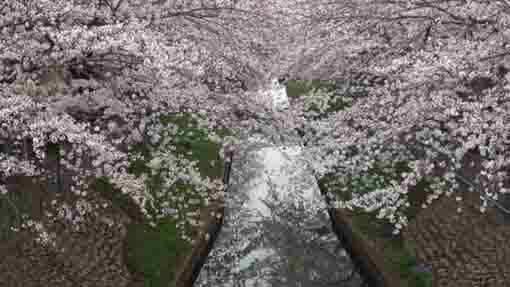 Michizane Sugawara was born in Kyoto in 845. Since he was virtuously learned a lot and having faithful principles in his mind, many people believe him as the god of scholarship. 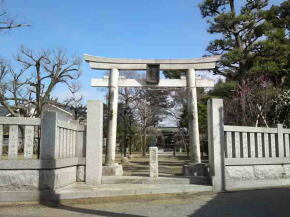 Shirahata Tenjinsha Shrine is the god of industrial promotion, bringing good fortune, child rearing, study and match making. 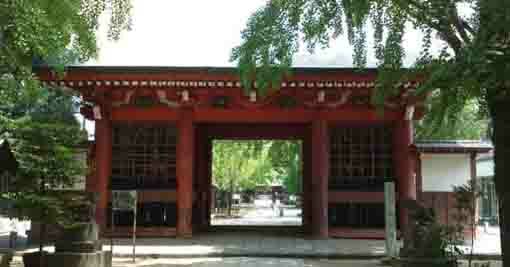 The framed letters hanged on the main hall of Shirahata Tenjinsha Shrine was written by Kaishu Katsu. Kaishu Katsu was a retainer of Tokugawa Shogun Family and a politician from the end of Edo period to Meiji era. His first name was first Yoshikuni, then Yasuyoshi, the middle name was Rintaro. Kaishu was his pseudonym. Kaishu study Dutch, gunnery and navigation hard, then he served at the office of translating foreign books in Edo Bakufu. In 1860, he crossed the Pacific Ocean and visited US with an envoy dispatched by the Bakufu as the captain of the ship Kanrinmaru. In 1864, he became a naval magistrate of the Bakufu and he contributed to build the navy and develop the human resources. At Boshin War, he led the samurai worriers belonged to the former Tokugawa Bakufu the allegiance policy toward the new government and he arrived at agreement with Takamori Saigo, the leading general of the new government, to accept the bloodless surrender of Edojo Castle. 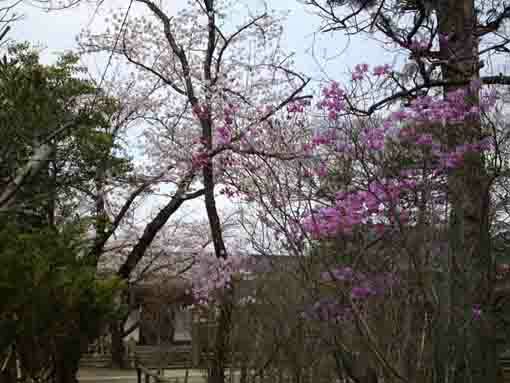 After the Meiji Restoration, he was appointed as a Councilor, a Minister of the Navy and a Privy Councilor. He wrote 'Kaikoku Kigen (the origin of the open door policy)', 'Bakumatsu Shimatsu (the short history of the end of Tokugawa Shogunate)', 'The Naval History', 'Hikawa Seidan' and so forth. 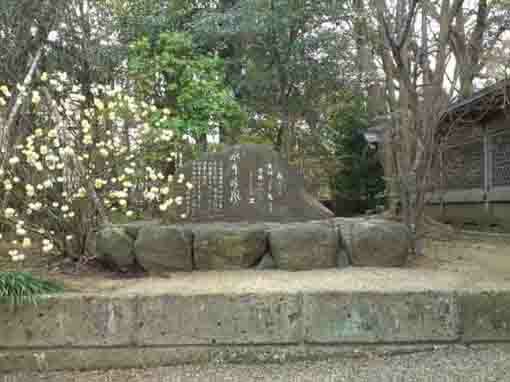 Anyway, Kaishu Katsu had close ties to Ichikawa city, there is a stone tablet scribed his letters on in Jishoin Temple in Gyotoku. 'Renkugaku' Painted by Zeshin Shibata preserved in Shirahata Tenjinsha Shrine is designated as the prefectural important property as in the field of fine arts and paintings by Chiba Prefecture. Zeshin Sibata from Edo was a painter and a designer of japan from late Edo period to Meiji era. Zeshin broke new ground of gold lacquer works and lacquer paintings. In 1890, he became the Imperial Art Expert. Ibaraki Douji Zugaku (the picture of the devil Ibaraki) and Bakufuzu Byobu ( a picture of waterfall on a folding screen) are his masterpieces. 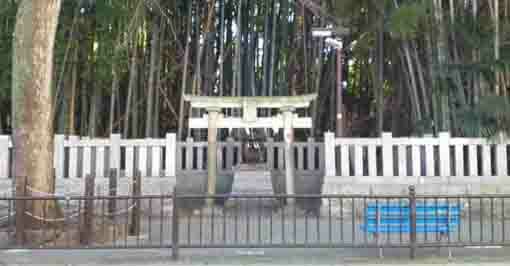 Shirahata Tenjinsha Shrine is appeared on the diary of Kafu Nagai named 'Danchotei Nichijo' several times. 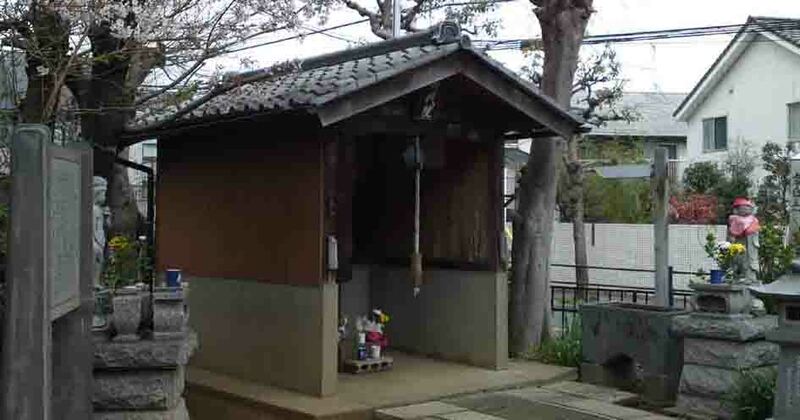 He often ate a piece of milk bread and drank a bottle of milk at a shop beside the shrine. He evaluated it better than it sold at Tokyo. 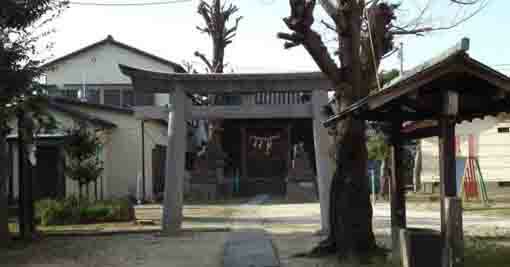 Shirahata Tenjinsha Shrine was on the way to Motoyawata Station from his house, then the shrine was in his dairy life. 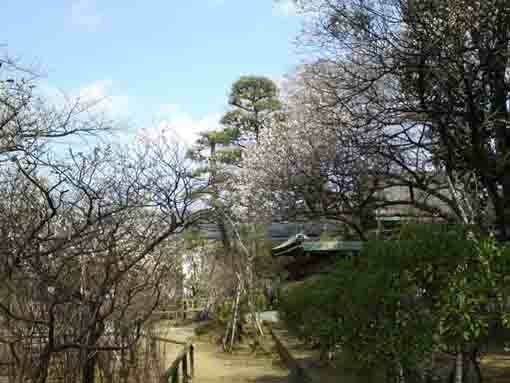 Kafu Nagai had to visit Shirahata Tenjinsha Shrine more often than above as it might be a course for a daily walk. Rohan Koda from Shitaya in Edo was a novelist, an essayist, a researcher and a doctor of literature. His real name was Shigayuki and his pseudonym was Kagyuan, etc. 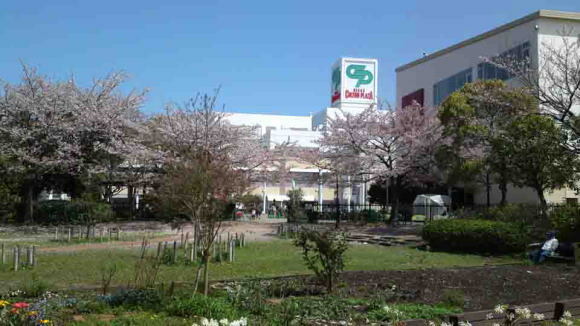 Rohan once moved to Hokkaido as a telegrapher in his young age. 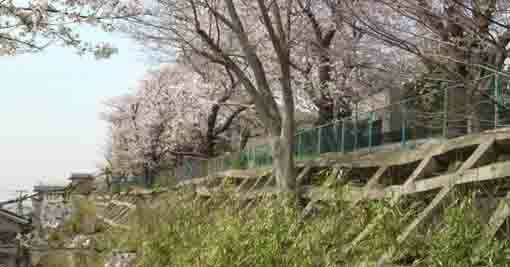 After he went back to Tokyo, he published 'Furyubutsu' and it was highly praised and recognized in the literary world. 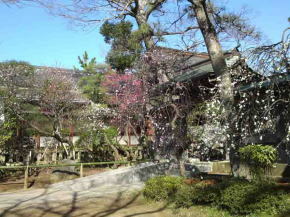 His strong pseudo-classical writing style has unique power, so he was praised so a great writer as Koyo Ozaki. He developed new frontiers on his essays, biographies and historical reports based on his oriental erudition, so he well understood French, Chinese and Japanese studies and he contributed the literary world. In 1937, he received the first Order of Culture. 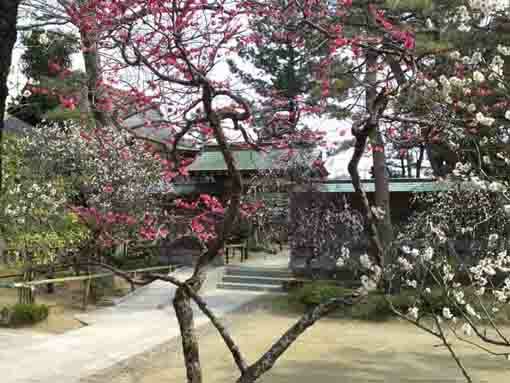 During the World War II, he lost his house Kagyuan by fire in Koishikawa, Bunkyo-ku, Tokyo, and he moved to Sugano, Ichikawa-shi near Shirahata Tenjinsha Shrine in 1946. 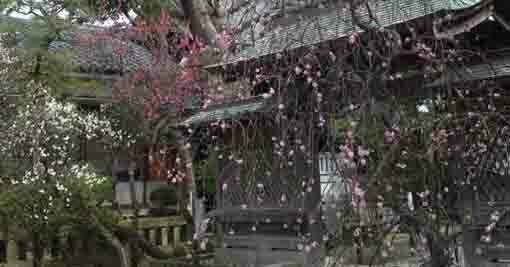 March in 1947, he completed 'Basho Shichibu shu Hyoshaku'. July 30th of 1947, he was passed at age 80. 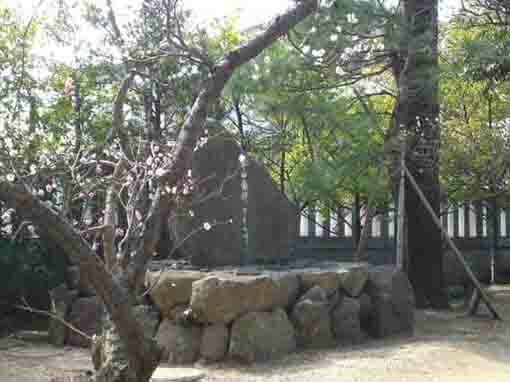 In his masterpiece 'Goju no To (the five stories pagoda), the Kishimojin of Nakayama Hokekyoji Temple appears, and he drew the landscaps of the stone steps of Mamasan Guhoji Temple in his essay. His masterpieces are 'Goju no To (the five stories pagoda)', 'Sora Utsu Nami (Waves washing in the Sky)' and 'Basho Shichibu Hyoshaku'. 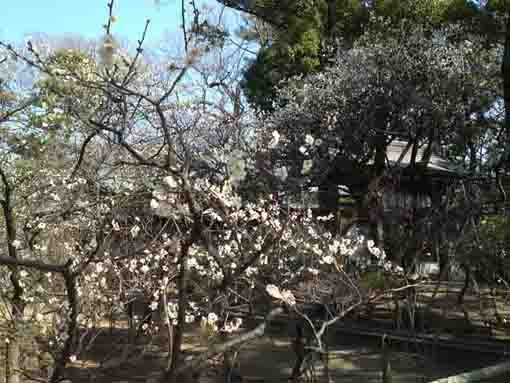 From February, many plum blossoms bloom in both Shrahata Tenjinsha Shrine and the park next to. 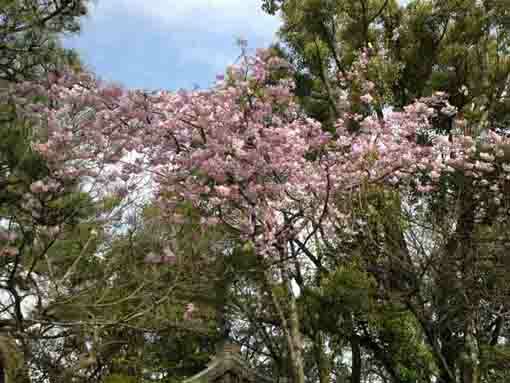 After plum blossoms, some cherry blossoms start blooming. 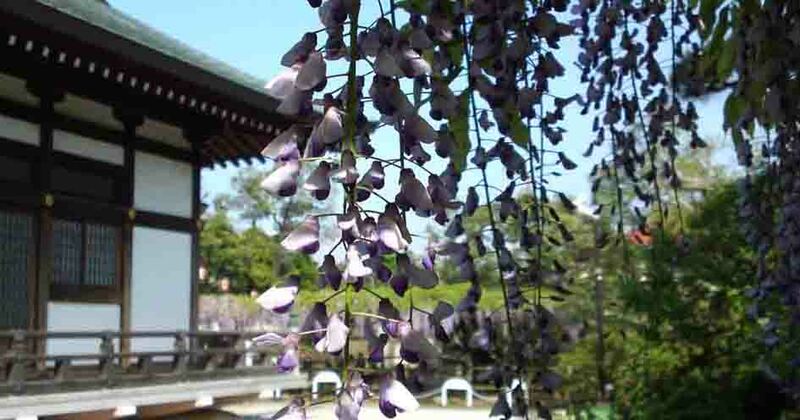 Shirahata Tenjinsha Shrine has great accessibilities from both Narita and Haneda International Airport.